The EA consists of 100 virtual Prototype-4 EAs with different settings. The outcome of calculations is the resulting lot. The idea behind the virtual strategies is that in case any of the virtual strategies is "wiped", the entire deposit is not, it is only decreased by 1/100, i.e. 1% (when using Risk=5000, VirtualBalance=5000). It is possible to set the lot size to start opening positions, the step and the maximum number of opened lots and positions using the settings of the EA. The Expert Advisor applies averaging and martingale methods opening positions by trend using several indicators. If a trend moves in the wrong direction, the EA either reverses the position, or closes and remembers it. Later, when a signal occurs, it opens positions stored in its memory. Recommended: EURUSD, USDJPY, EURJPY, AUDUSD, USDCAD, AUDJPY, GBPCHF, AUDCAD, CHFJPY, NZDJPY, NZDUSD and M15 timeframe. The EA parameters are specified in relative values, so that there are the same settings for different deposits and Risk parameters. The real lot = Relative lot*Balance*Value of one point/Risk. This ratio is shown in the information window of the EA. Working with multiple positions. For example, if MinLotToStart=0.02, Frequency=0.03, MaxTotalLots=5. In this case, the minimum position is limited to MinLotToStart = 0.02, any next position will be opened, if it exceeds Frequency = 0.03 (it may be greater than 0.03 but not less) and the total number of lots must not exceed MaxTotalLots = 5. The maximum possible number of positions in this case is (5-0.02)/0.03=166. Working with a single position. For example, if MinLotToStart=0.07, Frequency=0.1, Max Total Lots=0.1. In this case, the first position should be more than MinLotToStart=0.07, the next position must not be less than 0.1, the total amount of lots is limited to MaxTotalLots=0.1. So there will be only one position. Maximum number of lots on the account. Maximum number of open positions. SummerTime – season of time. used only during testing. Required for the EA to automatically shift GMTOffset by one hour. Limit Orders Of Symbol – limitation of open orders per symbol, 0 - no limit. SpreadLimit – set the spread limit in points. Manual Leverage - set account leverage manually. Slow Closing on Friday - if TRUE, virtual strategies do not start trading on Friday if they were closed with profit. ExtraRecovery (work if >1) – additional recovery. Global Recovery - use a global variable for Extrarecovery. Commission - compensation of commission from trades. NewsFilter - news filter. Impact: HighImpact - high. MiddleImpact - middle. LowImpact - low. Speaks - speeches. USDNewsForAll - USD news for all pairs. MinsBeforeNews - minutes before the news. MinsAfterNews - minutes after the news. StopLossProtection - if >0, a visible stop loss will be set to all positions at the specified distance. Реально работающий советник. Главное не жадничать и правильно провести настройки. На данный момент система уже год работает на боевых счетах с профитом. I give 5 star by good support and this only one EA stay long term in Market. I used for 2 year with total 87% profit and low DD. Setting follow rule that author recommend. Thaks Sergey for your try and support! update : 3/14/2018, HPA still going strong after 2 years. This EA and Sergey deserve more attention! It finally has been 1 year since I started using the HPA. Within 1 year, a lot of progression has been made to the EA and his level of support is not going down at all. Recent news filter and V.3 appear to work well and I have been making consistent profit over the time. Yes, you will see some lose here and there but the EA recovers your loss very well. I will continue to use this EA and feel very confident to recommend this to others. Wanna update my review, hope more and more people know HPA is a good EA & worth to buy one, also hope more and more people can pay attention and discuss in it. Here is my little experience, after I have used HPA more than one year, I thought I have got my satisfactory settings in last three months, maybe can help you. 1/ Run HPA in a low spread account, maybe you need a ECN broker, use V3 strategies. 2/ For low risk, please only trade some main pairs, I only trade EURUSD EURJPY USDJPY in a long time. 3/ Risk = 16000, Fix Balance = 6000, Start Min Lot = 0.01, these are my settings, but Frequency is another important variable, higher will trade more and maybe can earn more, but lower also means less orders and low risk, all depend on you. 4/ No need to use News Filter. 5/ Keep patient, control risk, believe HPA. 5 stars! A very good EA, if you have patience and set it well, it will help you to take profit. But before run it in live account, please back test it first, it will help you know HPA. Приобретался в 2016 году. Выполнялись все рекомендации автора, но советник так и не смог показать доходность... крутился около нуля. Good EA for longterm gains. To keep it save run it with high balance and low risk set (higher than 10,000), otherwise DD might be ugly. Pairs need to be selected according to balance and risk desire. Rebate system is recommended for additional income. I am not convinced that the EA will bring long term gains. The martingale part renders huge DD which probably will not be recovered. If you look at the developers signals, you see what I mean. I really had big hopes in this EA.... Sad to say this. With News Filter enabled and V3 it works fine now. EA is good but for me the profit did not out weigh the risks, I was looking for higher profits rather than long term investments but thanks again for the great coding. Have activation available if anyone wants message me. Did not have a very good experience with this EA. Very poor. Lost all my balance ($1000) with this EA. Firstly it should have been clear on the EA page that $1000 is very high risk. The developer should not expect the clients to trust his software first instance and add $10k in it from the beginning. Secondly $1000 should not be high risk, it should be a good amount to test the software so the client can trust it and then have the faith in the product to add more money. Finally did not think the developer put the effort so I understood how to minimize risk, his only argument was for me to add more money to decrease risk, which is stupid. It gets one star from me and there are other EAs in the market much cheaper and manages your risk much better. The DD in this EA is also really high, making it really risky! I purchased Sergey's HotPoint Trading system 2 months ago. I give it a 5 star review without any reservations. Sergey did not ask me to write this review. I didn't know Sergey until 6 months ago when I began asking questions about his trading systems. Anyone reading this review can contact me to ask questions about my experience with HotPoint/Sergey. I came across Sergey's system 6 months ago. I have a watch list of at least 10 different trading systems at any one point in time. I watch them all trade every day to see if I am interested in their strategies and comfortable with their risk. For 3 months I watched Sergey's portfolios trade every day. In July we rented the system for one month. Our objective was to use his default settings and to see if we could replicate the results of all his portfolios at Metatrader at our broker in demo mode. We outperformed his portfolios in that 30 day test. All of our portfolios were solidly profitable. We then purchased the system in August. We have run a much more conservative version of his system on a 3-pair (EUR/USD, EUR/JPY, and GBP/JPY) portfolio on a $25,000 live account. That portfolio is up +1.68% in 2 months of trading. That doesn't sound good but that's because our risk settings were so conservative that there is no way that the account could have made(or lose) much money. Our goal was not to make much money but to observe the trading. Now that we comfortable with the trading at our broker, we are increasing the account to $50,000 and trading 10 pairs, also with very low risk settings. Sergey offers a very good trading system and will generally respond to any question within hours or less. He is quite responsive to any question. His system is pure black box. We don't really know much about the investment strategy, though Sergey gives you some information on his product desription page. And we don't know anything about Sergey's background (education and career). But we are very satisfied with our purchase and recommend that anyone take the time to vet his product for yourself. UPDATE 6/8/17- We have now been running Hot Point with the new version for a couple weeks now, and are thoroughly pleased with version 3! We have noticed that the update has increased trade expectancy using less leverage. If Sergey we're to charge for this update we would be the first to pay him! Thank you Sergey for always being so helpful and putting in the work to update your system. Also glad Sergey is taking times out of improve and come with different setting (including V3). You wont get rich with it, but the profits are stable. Да советник действительно хороший, если все правила соблюдать. After one year of testing on demo accounts, smaller real accounts now I can say it is time for use that product also on bigger accounts. You can’t expect high profits with that product, but if you are looking for long term profits with a few % per month this is the right product for you. This product with constant improvements is real deal, specially v3. Thank you Sergey for that incredible EA. This EA will not blow your account although it's martingale type but a few months profits will lose within a day. Updated: Observed that this EA has very steady and long lasting in the market although many so-called top EAs have disappeared one by one. Further, the developer is keeping on upgrading his EA but will not leave it isolated. The programming on this EA is astounding and Sergey continue to develop this EA after 1.5 year of initial release.. The logic is brilliant and some pairs do sow long term profit potential. However not all the pairs are profitable, which is expected since this EA supports more than 20 currency pairs. Торгует почти год на счёте. Прибыль небольшая, теряется при сливе стратегии больше заработанного в разы. Советник хорош только в тестере, оптимизирован ТОЛЬКО под историю. Последние обновления советника так же, не более чем оптимизация под ближайшую историю и сливы советника. Регулярно сливающиеся сигналы автора тому подтверждение. Very good ea! Stable profit for 1 year! This EA is one of the best on market; using this EA since 6 month with stable profits. Also Sergey's support is excellent. 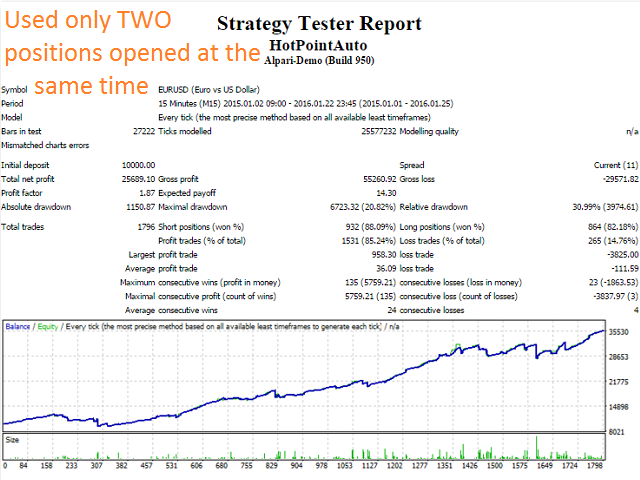 I review all bots on mql5 regularly and I missed Hot Point due to the fact that it implements martingale which I didn't like at all. I later on bought it and must say, if you put it on the right pairs on a broker with low spread you will get the most consistent earnings in forex you ever had. Not much if you get a low DD but fairly ok. So for me as a trader operating "put on and forget" this is just what I dreamed about. Get a broker with the lowest spread you can find, but it even works with market maker brokers. The risk settings are independent on your account size, you will get the same DD and thus also earnings on any account size with the same risk settings although it seems to be written in stone that the risk should be higher than the account size which is simply not true. Update 11.1.17: The bot is amazing and just keeps cashing. Use it on any pair you like but be sure your broker has a low spread as it is equal to cash on this bot. I am trying some tests with market maker brokers where the spread gets quite high and profits might diminish. Отличный советник. При низком уровне риска можно заработать 30-50% годовых. Но если вам нужна пилюля которая озолотит мнгновенно - вам не сюда. This EA didn't work well for me, I tried different risk settings but the results are the same, small profits and big losses. My demo account was going good until it went from $6000 to less than $3000 in one day using default settings, changing the settings for more conservative risk also didn't work, few days having profit and one day with another big loss. After a bad start, it is working much better now. Updating from 2 to 4 stars. Uses martingale, which is fine. But it usually closes out alot of losses. Over time, losses are more than winners. Account equity on a decreasing trend. All my HPA accounts run smoothly and make steady profits so far, I think this ea already stands out and proves itself in the market. 1. choose pairs wisely. My criteria is "3 highs"(profit/volatility/liquidity) & "2 lows"(DD/correlations), with these criteria, you will have less DD with your fund . Low correlations of pairs is important, so be cautious using too many JPY pairs, they are more profitable, but highly correlated. 3. accept necessary loss. Small steady gains with a sudden loss is the style of this ea, anything can happen, be prepared with DD and wait for recovery patiently. I have been using the EA for a while now. First I rented it for a month and it preformed very well so I purchased. Been profitable ever since. Yes there are times when DD occurs, but the EA generally recovers well. I have added it to the set of EAs that I run permanently on my accounts. I thought it worth updating my review. Of all the EAs I have checked and tested HPA is by far the best. It is making me a a good steady return. As with all trading there are ups and downs, but HPA is very good at recovering. Well impressed. Best EA on the market! I have been running Hot Point Auto now for 20 weeks with a live account. Over this time I have only had 2 weeks which haven't been profitable – and the losses incurred on these 2 occasions were all made back within 2 weeks. I am running 14 pairs (all except the CHF pairs, which with my broker have much larger margin requirements) with a risk factor of 3,500. Having read all of the information available (which I would encourage everyone to do), I understand that this is a very high risk strategy - but it's one that I'm comfortable with. Hot Point Auto is nothing short of miraculous. As those who have left less than positive feedback have pointed out, part of the strategy employed does appear to be based on Martingale. But that is only a very small part of the picture. Hot Point Auto is all of the things I was looking for in an EA. It trades frequently and, most importantly, makes fairly consistent profit. Yes – it does sometimes get itself into trouble if the market goes against it, but the way it works its way out of these situations is a joy to watch. And, in extreme circumstances, it’s not afraid to admit defeat and close all of its positions at a loss. However, when it does this, it never takes long to get back on track. Finally, the author is always on hand to provide quick replies to any questions and to support his product. As a software engineer myself, it’s not often I come across pieces of software that I really wish I’d written myself – but Hot Point Auto is definitely one of those – a fantastic piece of work! This EA is very professional. The author is also very responsive. so far so good, definitely seems like an EA that would make you money over the long haul. I've had the EA on a live account for almost three months now. I do turn it off during NFP and Interest rate decision days. Will update my review if something changes but so far I like it. I am running it on low risk and so far the DD has been very good, no red alerts. The EA is really making profit (not huge but constant) on my real account. EA trades a lot and open trades quite often. So to get some additional profit - it is better to use rebate. For traders, who are looking for rebates, I would like to offer my referral link http://www.bestrebateforex.com/index.php?refid=6YGT5PT. Bad EA, very risky, always against the trend, you are always in the position of loss floating equity! I quit it after using for 7 days on demo account. What a waste of money! Очень доволен советником. То, что советник не слил депозит за полгода - большая редкость на Forex с его Нон-Фармами и Брекзитами. Даже заработал. Смотрю в отзывах некоторые новички пишут - "советник идет против тренда, закрывается в убыток, но потом восстанавливается". Хочется их успокоить. Идти против тренда - это норма в торговле на Forex. Иначе все бы шли только по тренду, были бы миллионерами и не работали. Вопрос в том - КАК советник идет против тренда. По-моему - отлично. Используя запас в цене до критического уровня волатильности, советник управляет позицией. Но как только наступает предел волатильности, советник закрывает текущую и открывает противоположную позицию с объемом закрытой позиции (Recovery). Тем самым активно восстанавливая потери и зарабатывая новые американские рубли. Поиск альтернативы этому советнику не привел ни к чему. Только трата времени. Грааля нет. Но есть НРА 1.8. То, что автор постоянно работает над усовершенствованием продукта - большой респект. Пять звезд. Было бы шесть - поставил бы шесть. Рекомендую. Февраль 2016. Выгодно. Сто советников (стратегий) в одном. При цене 299 долл., один получается всего 2,99. Оптовая цена. Надежно. 100% диверсификация стратегий: полностью автоматическая торговля одновременно сотней советников и на каждого приходится 1/100 депозита. Советник содержит внушительный состав фильтров безопасности. Один из них - коридор волатильности. При выходе цены за его пределы сделка закрывается. Оценка критической волатильности производится автоматически по встроенному индикатору. Прибыльно. После установки на график, советник сразу начинает генерировать прибыль. Я такого еще не видел - сразу сделка и она прибыльная. Потом опять сделка. Прибыльная. Опять и опять. Советник просто заваливает профитом! И это на стандартном счете крупного банковского брокера с высоким спредом! Рекомендую. Вести торговлю одновременно на трех парах: EURUSD, USDJPY, EURJPY. Это увеличивает безопасность и прибыльность торговли. Для себя определил две настройки: "Актив" (депозит 1000, плечо 1:500, Risk - 1000, Max. Total Lots - 2, остальное по умолчанию); "Инвест" (депозит 5000, плечо 1:500, настройки по умолчанию). This stupid EA burned 14,000usd in my account.It has no 100 strategies as the vendor indicates at all but only aggressive martingale trades against the trend. It is a pure martingale bomber with no hedging, no stop loss and no trend following. One strong big trend will blow up your account for sure no matter what risk you set it only trades against the trend . This is a big warning ! Update : I confirm this EA is a very risky martingale one, you will keep losing your money no matter what settings the vendor recomends. I quit using it for good! The EA wipe off gains for the past few days. Although EA will do recovery in case of DD but recovery itself is risky if high impact news is impending as opposite positions will continue be open therefore relies purely on luck to recover. 3 stars given to Sergey for his good service. After couple weeks of deep test I decided to buy it. So far I have noticed that the lower risk the better. In my opinion I suggest having rather bigger account up to 50 000$ and using it with the same risk - 50 000 with 18 pairs the same time. It is the safest way of having a good night and constant profit. The vendor responds within few seconds and I am very glad we have Sergey in our community. I recommend it to all! I have also another products from Sergey and I never regret it I spend money on those masterpieces. It just need good settings and proper risk management - also big account is required. If you have those then you are on the way to earn nicely. 5 stars! Be careful. This ea is not good. If you use Alpari data, the result of backtest is good. But, if you use dukascopy data, result is very bad. And, the result of real trading (Peperstone) is also very bad. (+) The EA is hyperactive. With all 14 pairs running you are in the market round the clock with ~20 positions open. It's grabbing ~700pips per day (!!) and trading like hell (~900 trades/week !!). (+) The vendor seem to have done a bunch of work around how to CONTROL RISK and limit DD, which is the most important thing for long-term successful trading. It's the first kind of marti/grid-EA i know, which does not simply do position averaging, but is also capable to cut losses early and do partial closures. A lot of nice features included on the closing side, which is the most important part of the trade. (+) Also the vendor is extremely fast and supportive and the explanations look trustworthy. (-) You need at least 5k deposit for this EA (with more pairs even more) or you run on CENT accounts and are forced to go with shady market makers. The avg. balance of the retail trader is around 2-3k. Vendor is running CENT live accounts. Risk=5000 is recommended and optimized for. 5k still means you can have a full account blow, if all 100 virtual strategies fail, so it's better to go at least with risk=10k. Then you need at least also 10k balance as it must be balance higher risk. So you need really deep pockets to trade this one safely or a CENT account. (N) Shortly before weekend close on friday, the EA closes all positions (with a loss). On Monday it then tries to recover the loss with a higher lotsize. You can disable this feature, but then have to deal with GAPS. Overall it seems to work longterm, but can cause DD short-term. (N) Pairs can have temporary drawdowns. Over 2-3 months however, all pairs seem to be quite stable (see vendors accounts). (N) After a loss, the EA then enters the next basket with a much higher lotsize to recover the loss. This is a probability game. It seems it's working most of the time. The risk is that you can also crash the next basket and then with a higher lotsize your loss could be even much higher than the loss from the basket before. In terms of risk, it increases the risk a lot. At the end - it works. I am very pleased with the purchase and the service given by the author. I would like to see more EA's like this in the market. I have been running on demo for a long time and feel that this is the real deal. I do not know how in the hell this thing recovers from losses so well, but somehow it does. I'm using a real standard account now, and not a cent account. I had an EA for sell on here as well, but after using this, I decided to give it away for free. No comparison to the performance of this one. That's how much I like this. I bow down to the actual programmer of this EA. Why does it matter if the seller is using a cent account? The results are still the same. I've programmed lots of EA's and if I ran them all on standard accounts, I would be dead broke. Some are winners, and some are losers. This one is a winner. It is easy for someone to criticize an authors work, but I do not believe they realize how much effort it takes to actually program. Granted, it should be tested fully before being offered for sale, but no one can predict the future. Hotpoint is a very good Ea and especially intelligent. It generates constant gains. I think with respect to the Money Management and Risk Management could this EA work long term. I use the Ea on 2 accounts and am very satisfied so far. Sergey is very helpful and responds quickly to questions. So far 5 Stars! This is an incredible EA. I have been using it on live accounts for over 10 weeks. In that time the usable pairs has expanded from 3 to 12. My accounts using Hot Point have been extremely profitable. I have back tested a lot to determine my favoured pairs to trade. I am sure Hot Point looks forward to the weekend as it works so hard during the week trading round the clock taking lots of small profits to grow accounts smoothly and steadily. It is worthwhile monitoring position around big news. If there are too many open positions just before news announcements then I decrease the risk to reduce the exposure. My only comment for improvements is it would be helpful to have chart buttons to pause trading and change risk similar to pro pips. Parabéns Sergey,ótimo produto,simplesmente o melhor EA,obrigado pelo excelente suporte. Excellent product, excellent developer, highly recommended. Small steady gains, well thought out. Сергей молодец! Советник работает как надо. Best ea in mql5 maket. На демо счете показал себя очень хорошо, в ближайшее время планирую поставить на центовик. Прекрасное соотношение цена/качество. Обязательно нужен ВПС в режиме 24/5! Update(13.04.16). Две недели на центовом счете: старт с 2250 центов, сейчас уже +260 центов (+11.6%). Поставил на все пары. Общая пиковая просадка на счете не превышала 5% за это время. Просто удивительно. Еще пара недель испытаний и можно ставить на полноценный нецентовый счет. Fully customizable Risk profile to suit trader needs, adaptive algorithm, cuts losses quick, trades quickly -avg time in a trade 2-3H, this is the pinnacle of a great trading system in my opinion. Author very supportive and super helpful, always around and quick to reply and help out in any way. Its a honour and great pleasure to run this EA. I did a fair bit of back-testing on 10 years of tick-data before buying this, and the fact that I ended up buying it speaks for itself! So far (three weeks) it has behaved very well on the original three pairs. This weekend I will let it loose on some more pairs. I congratulate Sergey on what seems to be a robust and profitable EA. Rented a month ago and bought today. Perhaps it may be too early to write a review, but after a month of use I made a gain of more than 10% of the capital, before further price increases .. I bought it. Small steady gains, low DD (with risk 4000 on 3 majors pairs and 5000 on the remaining 6 pair. Also used togheter with other EA and manual trading, without problem. Used 3 weeks with older version and last week new version with added pair. I rented this EA and it seems to me that it trades on a real account as good as in the backtest. Amazing, Excellent EA ! Fixed StopLossProtection change. Previously, it was loaded from saved data and you should to press the Restart button to change it. Not necessarily now. The StopLossProtection will be the same as in the parameters. - Added AccountCredit () accounting. Added to the balance. - Added notification of VirtualBalance change. If you change VirtualBalance, then you need to click the Restart-Confirm button, all positions will be closed. - Calculation of Global and Local variables for recovery changed, compatible with GeneratorPro. If your variables are not empty, you will need to change them or reset them. - Added a new SpreadLimit with the calculation of the average value for 10 ticks. When SpreadLimit is triggered, trading is suspended. - Removed options with Leverage and Margin. - Added parameters VirtualMaxLots, VirtualBalance. 1) Added the Stop Loss Protection parameter - if >0, a visible stop loss will be set to all positions at the specified distance. The stop loss will be adjusted each bar. When the visible stop loss is triggered, the position will be reopened and a new stop loss will be placed on it. It is recommended for use if there is a risk of disconnection for a long time. If the connection is stable, there it does not need to be used. 2) Changed the default settings to Strategies=v_3. Added new Strategies V_4 for all recommended pairs. To change version, you should select Strategies=V_4 and after that click button Restart-Confirm, if no click then strategy can work with mistakes (because new virtual deposit = 2000, old = 5000). After Restart-Confirm all positions will be closed, and NeedToRecover will be=0, Extrarecovery will stay. 1. Added the 'Correction Margin Requirements' parameter. 2. Fixed strategies for USDCHF v_3. Optimized over a longer period. 3. Added v_3 strategy for USDCAD, NZDUSD, NZDJPY, AUDCAD, EURGBP. 4. Updated the strategy GBPJPY v_3. Please, check the settings after the update. They can be reset to default values. 2. Added v_3 strategies for CHFJPY, GBPUSD. 3. Changed the default values of ManualGMT=3, SummerTime=true. 4. Added saving the status of the SlowClose and TradeNotAllowed buttons. 1. Added updated strategies for EURUSD, USDJPY, AUDUSD, EURJPY, EURAUD and GBPJPY optimized on two brokers. 2. Added the Strategies parameter. You can choose the old strategy or the new one. 3. The speed of the algorithm is increased. 4. Added the pause button after clicking Close&Rem. 5. Added the TradeNotAllowed button. 6. Added the FixBalance option. 7. Added the SlowClose button. 8. Added the ability to run on other timeframes and pairs. But the EA was optimized and created for M15. 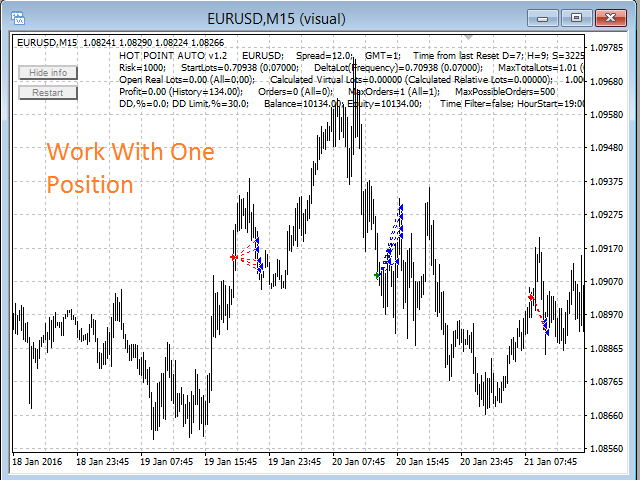 When run on pairs that are not supported, the EURUSD strategy is selected. Attention! Check your settings after the upgrade. It is recommended to press the Restart-Confirm button (but all calculations start from the beginning and positions are closed). 1) Fixed the function that closes SELL orders according to the FIFO rule. 1. Added the Extra Recovery parameter. 2. Added the Global Recovery parameter. 3. Added the Commission parameter. 4. Updated strategies for the USDJPY. Attention!!! After the update, settings may be reset to the default values, please verify settings after updating! 1) Revised Time Filter function: now, after HourEnd time expires, positions are closed and stored in memory (like when clicking on Close&Rem button). Positions are opened by virtual strategy signals. 4) Added Pause button — disable internal calculations. 5) Added Close&Rem button — (when followed by Confirm button) close the current virtual strategies and move them to memory. 6) Added 'Slow Closing on Friday' parameter - if TRUE, virtual strategies do not start trading on Friday if they were closed with profit. 7) Displayed the number of active strategies on a chart: in Buy direction, in Sell direction and Without Trades. 8) Optimized the EA logs (decreased the log size). Optimized the messages about saving data to file and exceeding the limit. 1) Added optional saving of information every hour. The primary saving is left at every 15 minutes. 4) Added virtualization of 1:500 leverage. Now the EA works correctly with any leverage. Added parameter Manual Leverage =0 (if 0, then automatic detection of the current leverage). You can set this parameter manually if the leverage of the symbol is different from the leverage of the account. 1) Fixed the error when saving the settings file, if the symbol has a suffix "..." and ".."
2) Fixed the display of the lines in hidden mode. 4) The default settings have been changed to SummerTime=true, ManualGMTOffset=3. 1) Added pairs USDCHF, USDCAD, AUDUSD, GBPUSD, NZDUSD, EURAUD, AUDJPY on M15 timeframe. 2) Added parameter SpreadLimit - set the spread limit in points, 3.0 by default (automatically multiplied by 10 for 5 digit servers). If the spread is greater than this parameter, then virtual strategies work only in the mode of closing, new positions are not opened. The exceeding of the limit is displayed on the chart by a message in red. 3) Added the output of the 'Need To Recover' value to the bottom of the chart for the information on how much needs to be recovered in the deposit currency (after a reversal or closure). 4) Added information lines for the trading channel. The green lines represent the beginning of the forced closure threshold for the positions of virtual strategies, the pink line represents the end of the channel. 5) Fixed the display of the time when trading is impossible at 'Time Filter = true' on the chart. 1. Added the display of the information on the closed lots that will be opened in future at the bottom of the chart. 2. Added SummerTime parameter. This parameter is used ONLY for testing. Required for the EA to automatically shift GMTOffset by one hour when the broker time is switched. Set this parameter to true, if it is Daylight Saving Time now, and to false, if it is not. Also make sure you set the current GMTOffset of the broker in the ManualGMTOffset parameter. Improved virtual strategies for EURUSD USDJPY EURJPY. They will be updated automatically after update of EA.